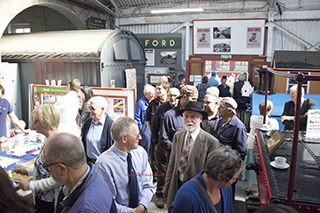 The South Devon Railway celebrated the 50th Anniversary of the very first train movement of the heritage era on the Ashburton branch last Friday. 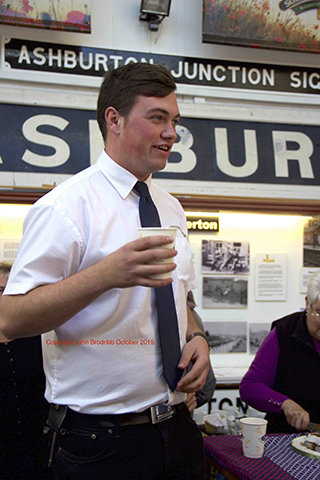 This was 2nd October 2015: on 2nd October 1965 4555 brought 2 auto coaches down the branch to Buckfastleigh, and 3205 brought 2 more; last Friday we recreated the train with 3205, with the help of 5542 Ltd.
First there was a celebration in the SDRT Museum at Buckfastleigh, where over 70 people from all parts of the South Devon Railway and the local community crowded in. There is a small display in there to mark to anniversary, and a specially-made DVD was playing. This was produced for the SDRT Museum Support Group by two local students, and features three of the people who were present 50 years ago: Bob Hill, Bryan Gibson and Richard Elliott. All were present on Friday. After some remarks by the three “old boys” SDRT Museum Curator John Brodribb invited Rowena Houghton and Susan Johnson to say a few words. 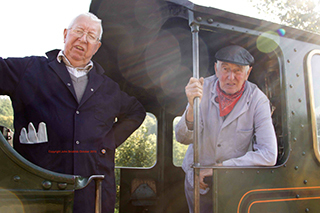 Their fathers – Bob Saunders and John Evans – were founding directors of the Dart Valley Light Railway Company, who set up the enterprise. 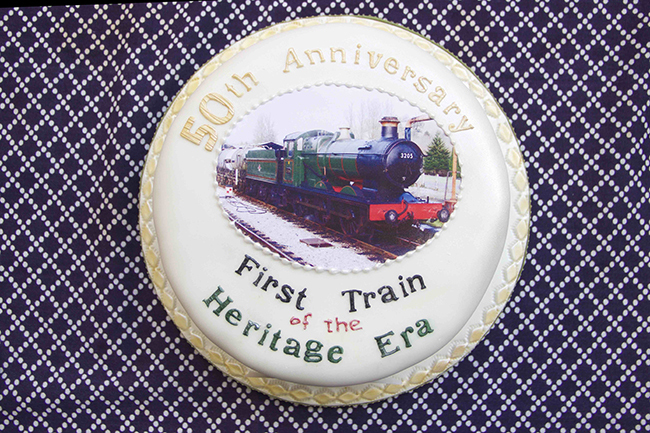 They then cut a celebration cake, and the first 50 years were toasted – in tea (this is a railway, after all) – by SDR Trust chair Alan Taylor. Alasdair Page proposed a toast to the next 50 years: hopefully he will be there then! 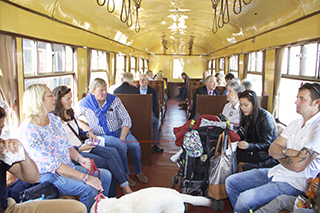 Guests then boarded the special train, with Dave Knowling and Colin Harmes on the footplate, and Alan Taylor as guard. Leaving Buckfastleigh at 1.00pm it ran to Totnes, where lunch was taken, and departed at 2.00pm for Staverton. 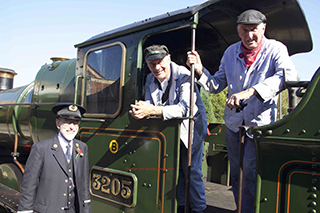 Events of 50 years ago were re-created, with Richard Elliott boarding the train, and Bob Hill managing to get in the footplate. Bryan Gibson also managed to get on board. 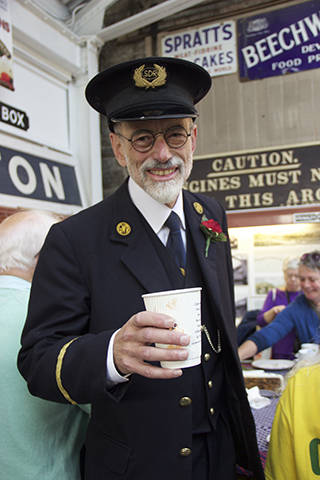 All in all, a very enjoyable day, and one that very successfully marked a momentous anniversary on the South Devon Railway. It also brought together all parts of the SDR, staff and volunteers, and many members of the local community and organisations. Here's to the next 50 years! In the 1950s the economics of rural branch lines began to look increasingly dodgy, and the Western Region of BR was keen to save money. In common with almost all their other branch lines in Devon they closed the Ashburton branch, first to passenger traffic on 01 November 1958, and then to goods in September 1962. The Brixham, Moretonhampstead, Kingsbridge and Launceston branches, together with the Teign Valley line, closed at much the same time. Princetown and Yealmpton were long gone. Hardly had the last train run on the Ashburton branch than moves were afoot to preserve it. Numbers of schemes were discussed, and the Moretonhampstead and Kingsbridge branches were also possible candidates. In the end the Dart Valley Light Railway Company was set up by a group of local businessmen, and made moves to acquire the line, together with locomotives and coaches. The Great Western Society was also actively interested. On 02 October 1965 the first evidence of the heritage era appeared. A rail tour from London Paddington was scheduled to run to Plymouth, with 4-6-0 No 4079 Pendennis Castle at its head. This took the train as far as Exeter St Davids, where it was taken off and went to Exmouth Junction for servicing. 2-6-2 No 4555 and 0-6-0 No 3205 backed onto the train, both already in the hands of private owners, and took it as far as Totnes, where they too were detached. They were then used to haul two auto coaches each along the Ashburton branch, as far as Buckfastleigh; all were to be used on the fledgling Dart Valley Railway. Many enthusiasts from the special train took advantage of the chance to ride along the closed Ashburton branch, and could only get back to Totnes later because 3205 operated an extra train with its auto coaches. 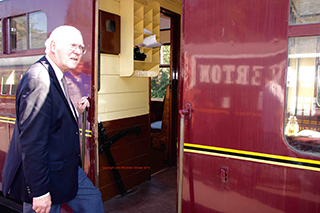 The coaches were stored in the goods yard at Buckfastleigh, whilst the locomotives were locked in the goods shed, now the South Devon Railway’s Carriage & Wagon works, and the museum.